The Adderley brothers of Tampa, Florida were, quite simply, a gift to the world of jazz and music in general. Horn blowers both, older brother Julian Edwin Adderley (nicknamed "Cannibal" as a kid because of an insatiable appetite that turned a big boy into a plus-sized man) preferred alto saxophone while three-years-younger Nathaniel Adderley started with the trumpet, then gravitated towards the similar but more unique-sounding cornet. Their family had moved to Tallahassee by the late 1940s and Julian seemingly settled into a job as a high school music teacher. But on a visit to New York City in 1955, he reluctantly sat in one night with Oscar Pettiford's band at the Cafe Bohemia in Greenwich Village. Comparisons to "The Bird," Charlie Parker, were immediate, though Parker was only one of the 27-year-old's many influences. Within days he found himself in the studios of Savoy Records. By that time, after a series of misunderstandings about his nickname, "Cannibal" had evolved into "Cannonball," despite there being no basis for the newer moniker. Credited as Julian "Cannonball" Adderley, he made his recording debut on drummer Kenny Clarke's album Bohemia After Dark (the title track penned by Pettiford), released that same summer of '55. Brother Nat Adderley hustled up to the big city and took part in the stellar set, which featured a number of top NYC musicians: pianist Horace Silver, trumpeter Donald Byrd, bassist Paul Chambers and Jerome Richardson on tenor sax and flute. According to the liner notes of Julian's debut album, Presenting Cannonball, it was released just a week after Clarke's all-star Bohemia set. Most of the same players contributed to the five-song LP; "Spontaneous Combustion," quite nearly describing the sudden appearance of both older and younger Adderleys, led off side one. Then Nat took his turn with the Savoy effort That's Nat, kicking off a series of more than three dozen albums over four decades. 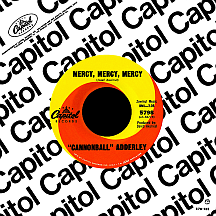 But the main focus was always on Cannonball; near year's end the older Adderley left Savoy for Mercury, waxing several fine discs for the label and its EmArcy subsidiary over the next three years. During this time the brothers formed a quartet, but it fell apart when Cannonball was offered a spot with Miles Davis's band, recording for Columbia Records. 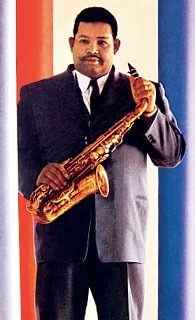 On 1958's Milestones, Adderley blew a rapid-fire, brain-scorching alto, having no problem keeping up with the demands of Davis's progressive trumpeting technique. A side project for Blue Note, Somethin' Else, found Davis and skin man Art Blakey in the lineup. Then Portrait of Cannonball became his first LP for the Riverside label; credited to the Julian Adderley Quintet, it featured fellow Floridian "Blue" Mitchell on trumpet, Sam Jones on bass and two of Miles' men: drummer Philly Joe Jones and pianist Bill Evans. After contributing to the top-selling Davis album Kind of Blue in '59, Julian and Nat started a new quintet, and this time the pieces fit perfectly, though personnel rotated quite a bit over the next decade. Pianist Bobby Timmons, who'd been the ivory man for Blakey's Jazz Messengers band, took a break in the fall of '59 and jammed for a time with Adderley and company; a live recording of Timmons' "This Here" is a highlight of Bobby's, and Cannonball's, careers. The first true Cannonball classic debuted in 1960 with a song composed by Nat and Oscar Brown, Jr. "Work Song" was actually recorded by the younger Adderley a few days earlier with nearly the same lineup of musicians. The ravenous alto sax man's composition "Sack O' Woe" was an R&B hit for the Ray Bryant Combo in the spring of 1961, just as Julian broke through with his own pop hit. Billed as the Cannonball Adderley Orchestra (a group of 20 musicians arranged and conducted by Ernie Wilkins), his single of "African Waltz" made a strong showing on the pop and R&B charts (in England, Johnny Dankworth reached the top ten with his version, which also made a brief U.S. chart appearance). The uptempo big band track put a new slant on the standard triple-beat waltz structure and sounded nothing like any previous Adderley track...or anything else on the African Waltz album, for that matter. Composer Galt MacDermot won two Grammys for the song (in the Best Original Jazz Compositon and Best Instrumental categories). Afterwards, Cannonball had a much larger fan base; albums came out frequently (there were more than 50 in a 20-year span) as the big man's band played to packed nightclub crowds. Cannonball and Ohio-born singer Nancy Wilson had known each other for some time when, in the summer of 1961, they collaborated on an album (obvious title: Nancy Wilson/Cannonball Adderley) and hit single "Save Your Love For Me," a soft, soulful effort with the altoist at his most laid-back. It was her first hit and his first project for Capitol Records, though it wouldn't be the last. The following year, Nat put the finishing touches on his composition of "The Jive Samba," a scorching, often-imitated, never-duplicated eleven minute jam taped for posterity at the Jazz Workshop in San Francisco, a club where the band often gigged and had previously made recordings. The single edit gained notice in early 1963 and the resultant album, Jazz Workshop Revisited, was his best seller to that point, thanks in part to its expanded, six-member lineup with key contributions coming from two important additions: Austrian pianist Josef Zawinul (who'd kicked off his U.S. success story playing on Dinah Washington's huge '59 hit "What a Difference a Day Makes") and Tennessee-born Muslim Yusef Lateef, a master of saxophone, flute and several other instruments. Riverside went out of business in 1964 after the death of the company's president, Bill Grauer. Adderley signed a contract with Capitol that granted him the same kind of creative freedom he'd enjoyed at Riverside, but initially his efforts weren't particularly well received. His mindset was more socially conscious by 1967, as onstage introductions became increasingly personable and entertaining. "Sometimes we're not prepared for adversity...we don't know exactly how to handle it..." was how he chose to introduce Zawinul's brilliant "Mercy, Mercy, Mercy," an irresistible, mellow groove recorded before a live, invitation-only audience at the Capitol Records studio (simply referred to as "The Club" on the album cover) with Nat, Josef, bassist Victor Gaskin and drummer Roy McCordy. The five minute piece, boiled down to the nitty gritty on a three minute single, reached the R&B top ten and pop top 20 in the winter of '67, inspiring outside lyricists to create varying vocal versions of the song, the most successful a top ten hit that summer for brass-based Chicago soul rockers The Buckinghams. 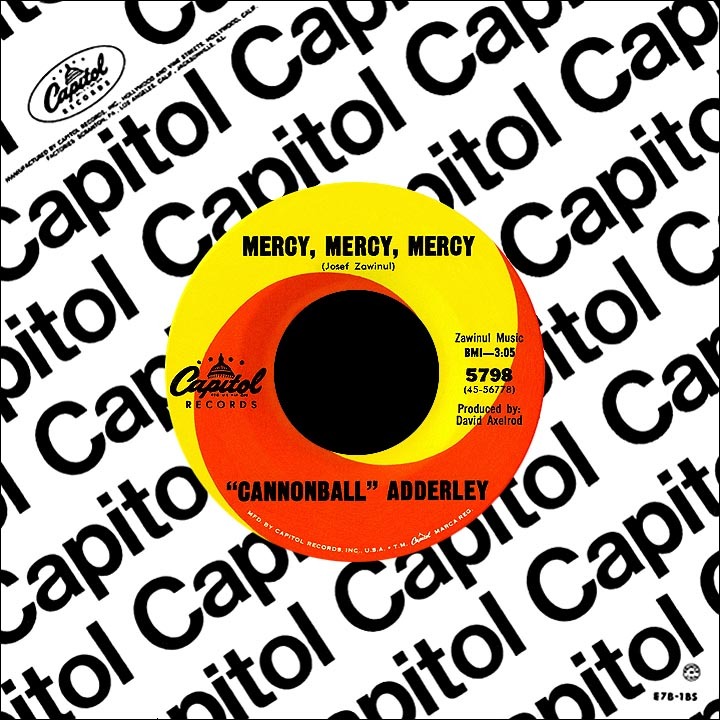 "Mercy, Mercy, Mercy" was Adderley's shining moment, a Grammy winner for Best Instrumental Jazz Performance by a Large Group. Roebuck "Pops" Staples received a respectful intro by obvious fan Cannonball on the quintet's version of The Staple Singers' "Why? (Am I Treated So Bad)." Between sessions with Julian, Nat continued making his own albums, experimenting with amplifying and electricizing his cornet, evident on enticing efforts like 1968's "Electric Eel." As the '60s came to a close, Cannonball had further success with the relaxed-feel "Country Preacher." In 1972, he spearheaded an elaborate project, "Soul Zodiac," issued on six consecutively-numbered Capitol singles, each covering two astrological signs; a modern mixture of jazz, soul and rock, the tracks featured forceful, borderline-disturbing narration by Rick Holmes, a jazz deejay on Los Angeles radio station KCBA. Josef Zawinul branched out in the 1970s, forming the famous jazz fusion band Weather Report with sax man Wayne Shorter. Two decades into his career, it seemed Cannonball was just beginning to roll, but a stroke halted the proceedings and he died in 1975, at age 46, of a cerebral hemorrhage. Nat Adderley kept his memory alive while adjusting to the loss of his brother in both private and professional life. Nat performed extensively in Europe in the latter half of the 1970s and later taught music courses at Howard University in Washington, D.C. Throughout the years, he continued performing and recording with many of Cannonball Adderley's pals, the musicians who at one time or another had worked and played with his famous brother.